UN ENTRETIEN POUR VOUS ASSURER QUE VOTRE LIVRET D’ENTRETIEN EST SIGNÉ ET DATÉ. not be covered under your warranty. 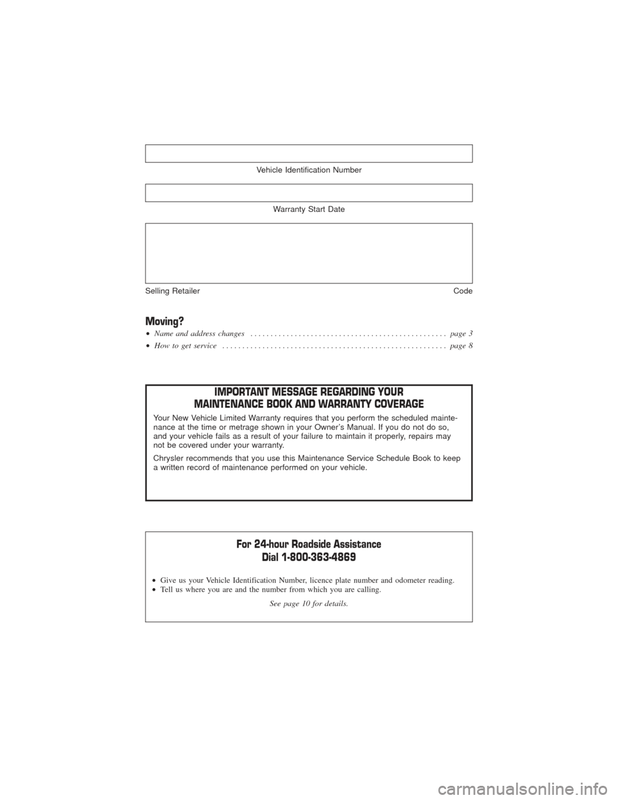 a written record of maintenance performed on your vehicle. •Give us your Vehicle Identification Number, licence plate number and odometer reading. • Tell us where you are and the number from which you are calling. See page 10 for details. THIS BOOKLET SHOULD BE KEPT IN YOUR VEHICLE. Chrysler andChrysler Canada mean Chrysler Canada Inc.
vehicles by Chrysler Group LLC. trademark of Chrysler Canada Inc.
CCI’s complete Privacy Statement, please visit our website at www.chrysler.ca/privacy. and disclosing it for the purposes described in this statement. with regulatory requirements and offer you benefits and product information. personal information for their own purposes. at any time to anyone we choose. 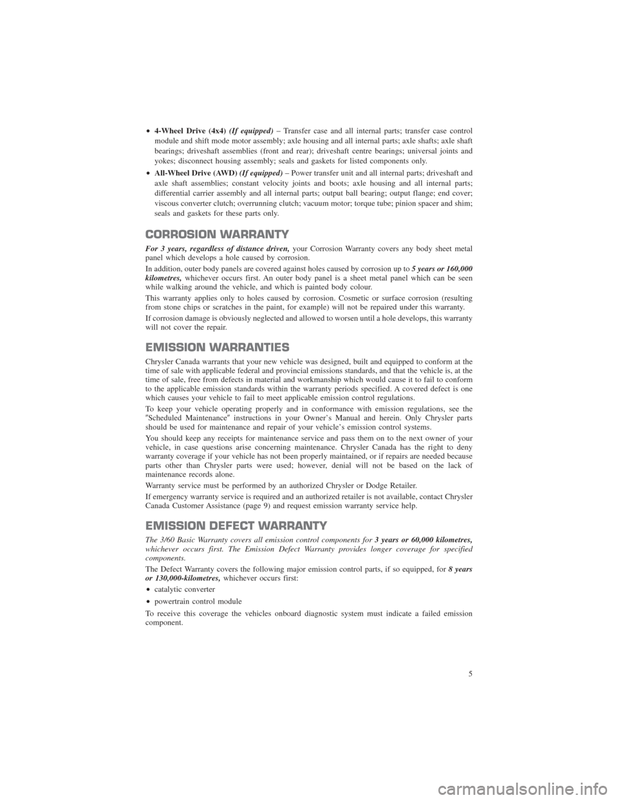 The limited warranties in this booklet are the only express warranties made by Chrysler Canada Inc.
resulting from breach of these written warranties or of any implied warranty or condition. Manual and herein, is essential to trouble-free operation. service and maintenance for your vehicle. High-tech diagnostic equipment is sometimes needed to service a vehicle efficiently and accurately. technicians can render the skilled care your vehicle needs. vehicle from any Chrysler Retailer. 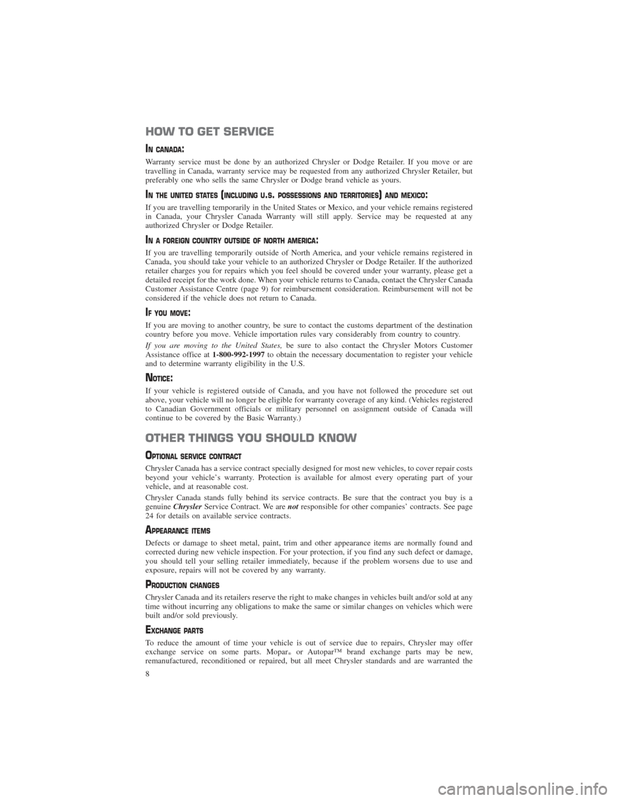 See “How to get service”on page 8.
registered and normally operated in Canada. 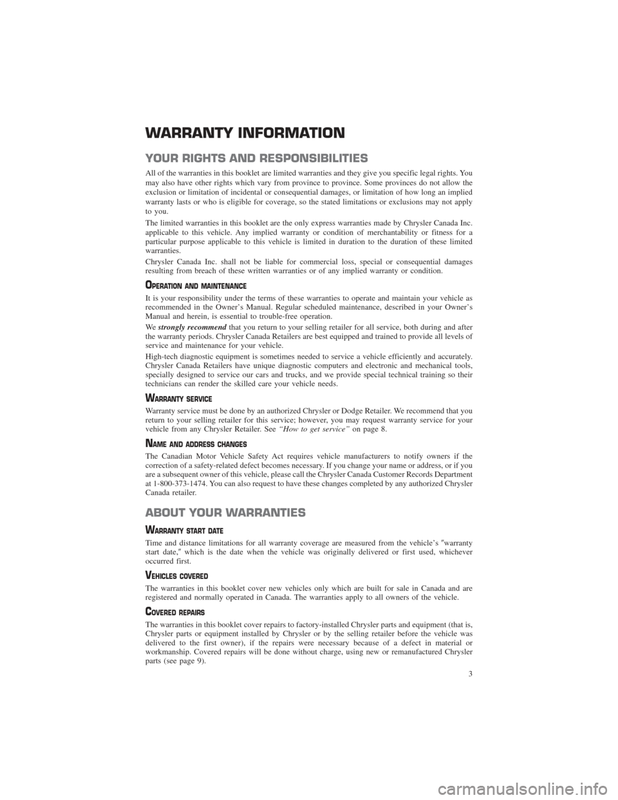 The warranties apply to all owners of the vehicle. yokes; disconnect housing assembly; seals and gaskets for listed components only. seals and gaskets for these parts only. panel which develops a hole caused by corrosion. while walking around the vehicle, and which is painted body colour. from stone chips or scratches in the paint, for example) will not be repaired under this warranty. will not cover the repair. which causes your vehicle to fail to meet applicable emission control regulations. should be used for maintenance and repair of your vehicle’s emission control systems. 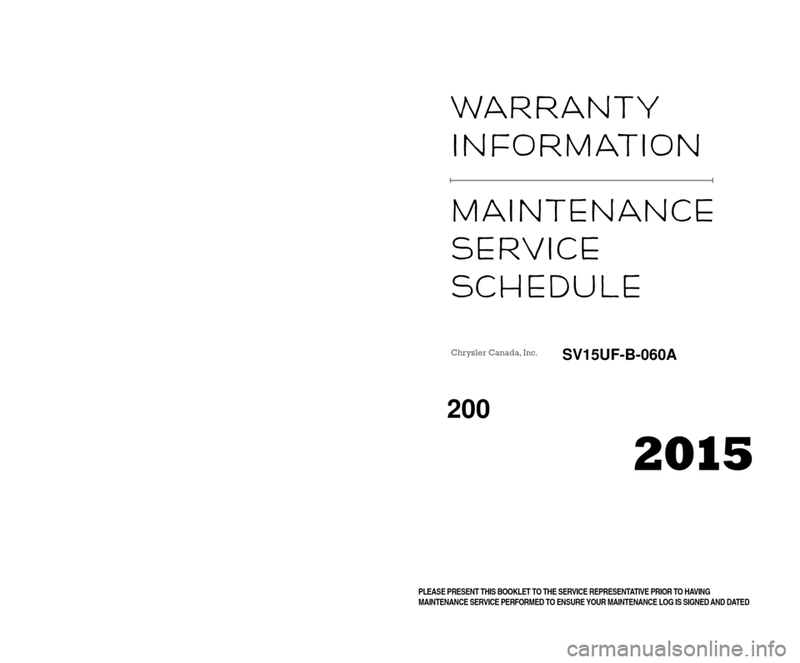 Warranty service must be performed by an authorized Chrysler or Dodge Retailer. 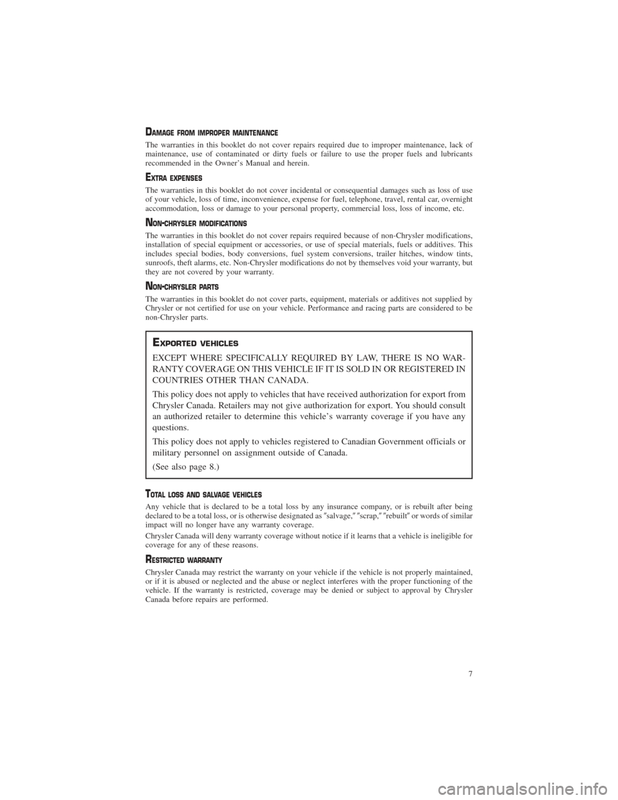 Canada Customer Assistance (page 9) and request emission warranty service help. 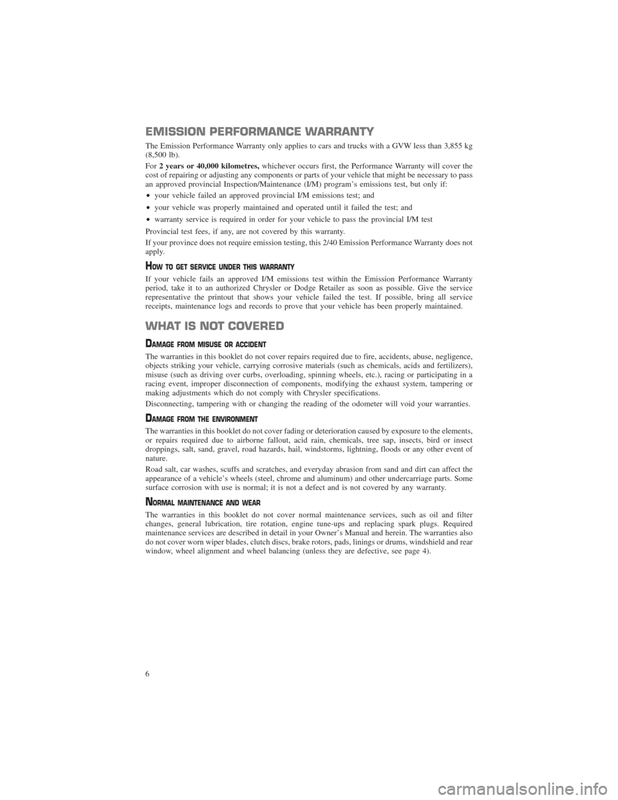 Provincial test fees, if any, are not covered by this warranty. receipts, maintenance logs and records to prove that your vehicle has been properly maintained. making adjustments which do not comply with Chrysler specifications. Disconnecting, tampering with or changing the reading of the odometer will void your warranties. surface corrosion with use is normal; it is not a defect and is not covered by any warranty. window, wheel alignment and wheel balancing (unless they are defective, see page 4). recommended in the Owner’s Manual and herein. accommodation, loss or damage to your personal property, commercial loss, loss of income, etc. they are not covered by your warranty. military personnel on assignment outside of Canada. impact will no longer have any warranty coverage. coverage for any of these reasons. Canada before repairs are performed. preferably one who sells the same Chrysler or Dodge brand vehicle as yours. 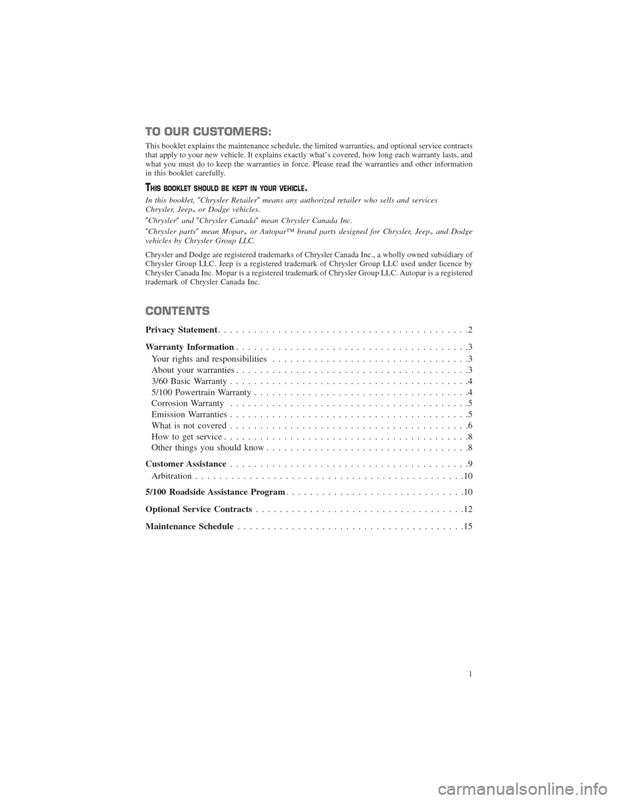 authorized Chrysler or Dodge Retailer. considered if the vehicle does not return to Canada. country before you move. Vehicle importation rules vary considerably from country to country. 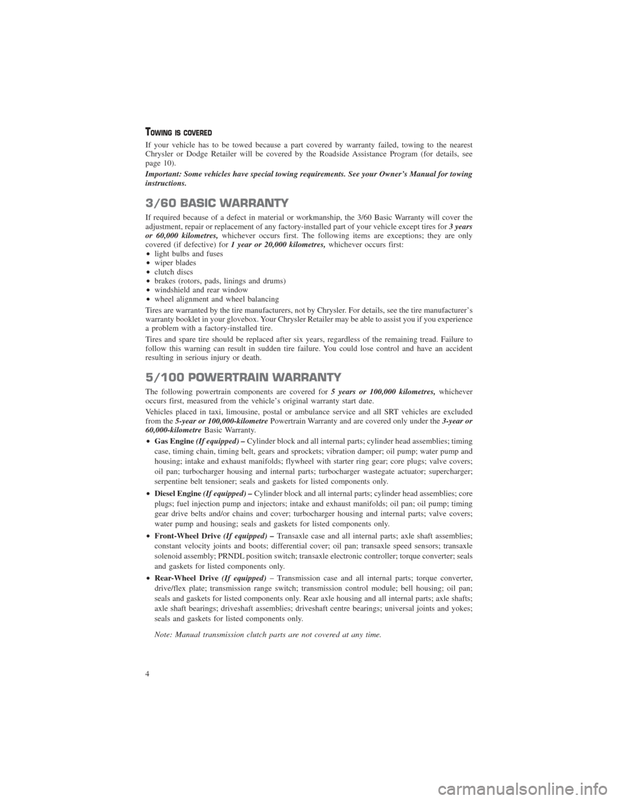 and to determine warranty eligibility in the U.S.
vehicle, and at reasonable cost. 24 for details on available service contracts. exposure, repairs will not be covered by any warranty.